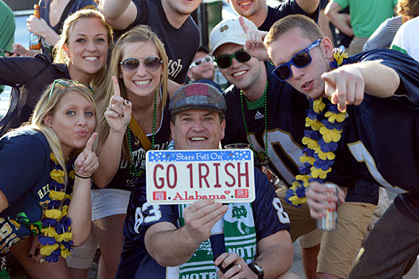 Notre Dame fans tailgating for the BCS Championship. Miami: Picture the scene in the distant parking lot at Sun Life stadium in Miami on Monday night. I had gone back to my rented car to retrieve the car keys, realizing in my rush to get to the game I had left them in the ignition - duh! A family of five was sitting around in near darkness, attention glued to a small computer screen in front of them showing the first half highlights. They were the only live occupants of the parking lot, sitting in the eerie glow of the nearby stadium lights, a part of but apart from the BCS Championship game. Notre Dame was so far behind at that moment against Alabama that if it were a boxing match the bout would have been halted, but the family of five seemed undaunted. They wished me good cheer and asked if I wanted to join them. Curious as to their story, I did for a few moments. They had driven from Virginia and had no hope of seeing the game and could not afford the tickets anyway. They had watched the Wake Forest game live in the stadium but otherwise they drove from game to game following the Fighting Irish from a series of parking lots. They loved to tailgate and join their fellow subway alumni wherever the green was worn. Before you dismiss them as nuts, you have to understand the nature of the true Domer to whom no Notre Dame game is ever out of reach. I met so many in South Florida who consider Notre Dame games a holy pilgrimage, who build their year around them and win, lose, or draw will follow the Fighting Irish to hell and back again. After the game I walked back to that same parking lot with a family of three, a mother and two young daughters, also from the South. They were able to recite chapter and verse of every game they had attended and the cross-country trips they regularly took. I would think the two daughters were early teens if that, but they were able to remember Notre Dame players like other kids could say the names of the One Direction boy band. There is a lot to that, the sense of family that grows up around Notre Dame followers. It is one great shared ambition finding voice on playing fields from California to New York and even Dublin last year. TV ratings were up 67 per cent for their games in 2012. Notre Dame remains a phenomenon of American sport. They could play a community college and 80,000 would show up. It reminded me again of the similarity to Celtic soccer team, that other great Irish Diaspora side from Scotland who have come to embody something very deep in the souls of the children of Irish immigrants worldwide. There is a shared pride and commitment to the heritage and memory of those who came before them. Notre Dame have been playing football for 125 years. Celtic was founded in 1887 by Brother Walfrid of the Marist brothers, an Irish religious order. Irish priests were the foundation stone of Notre Dame too by the Holy Ghost fathers. Both teams were blatantly discriminated against by top sides, which resented their religion through the early years and relegated them to underdog roles. Because of that through the generations the commitment to the teams, as an intrinsic part of the DNA of the Irish emigrant experience, has lived on in millions. What I saw in the parking lot and witnessed this week was much of that, mixed with pride and an embrace of all that is best in old fashioned America. Celtic defeated Barcelona this year, the greatest club football team in the world led by Lionel Messi, arguably the greatest player in world soccer. It was one of the biggest shocks of recent times. The Irish of Notre Dame went undefeated until the Alabama crash and burn but had a season to remember. Generations later those who follow them still have so much to treasure and to find common cause with. Little wonder that they continue to be kingpins in their respective sports and to attract millions of followers, some of whom will never see them live.